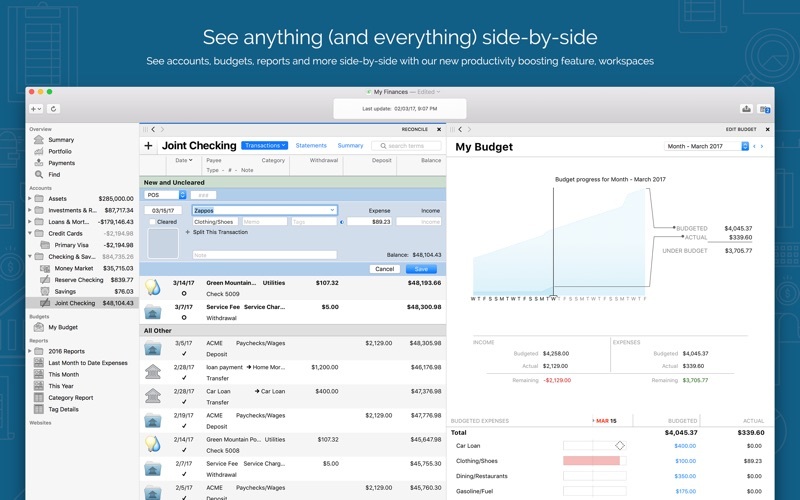 Banktivity 6 ushers in a new level personal finance management software for macOS. 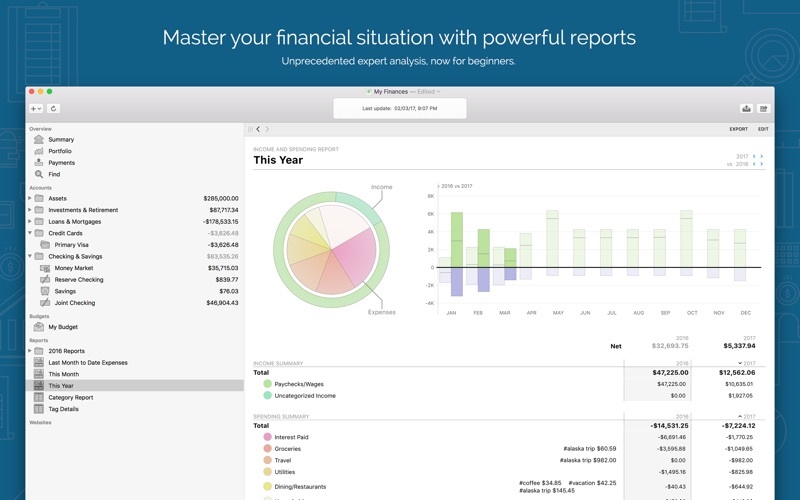 Whether you're taking your first steps in getting your financial house in order, or you're a seasoned veteran of financial software, Banktivity 6 helps you take complete control of your money. World-class technical support via live chat and email with US-based representatives. 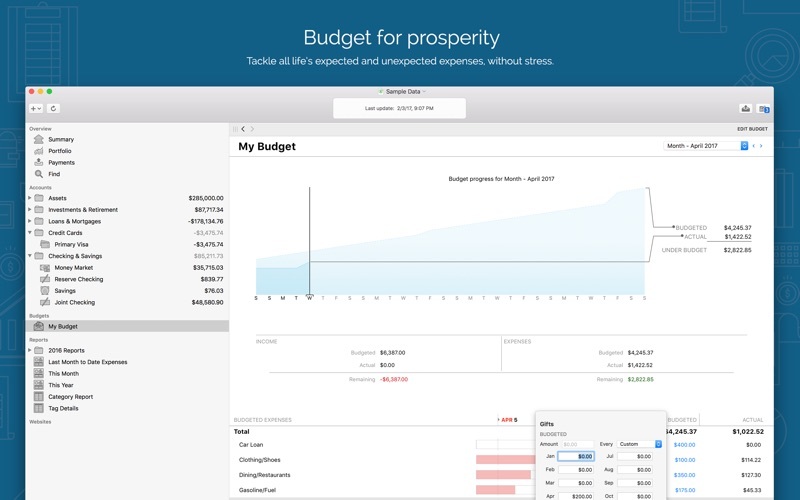 The first step in money management is to get all your finances in one place. 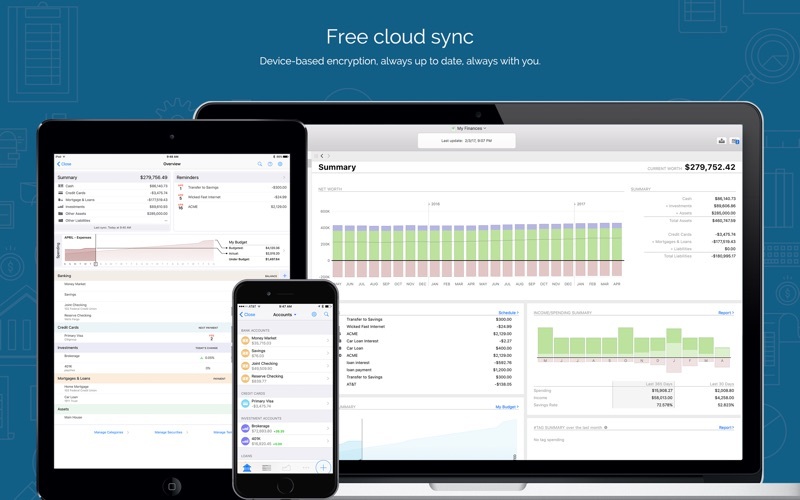 If you’ve used software like Quicken (for Mac or PC), Banktivity's set-up assistant will import your old data. Next — or if you’re just starting out — download current transactions from your accounts online, at no cost, via direct connection to your bank or by using Banktivity's built-in browser to view your accounts and download your data for free. 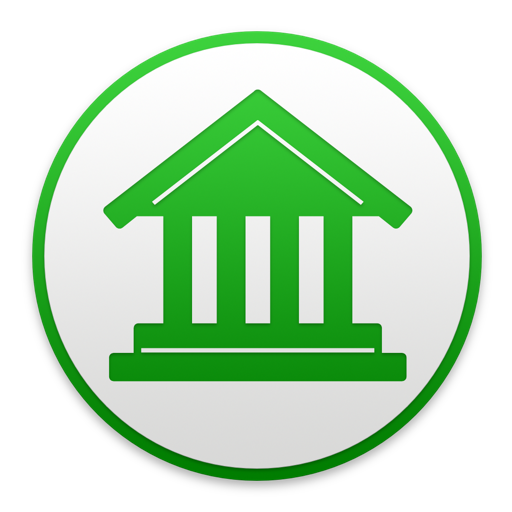 Banktivity's optional Direct Access* service makes this even easier by connecting to over 10,000 banks worldwide, automatically delivering the latest transaction data to your Mac. 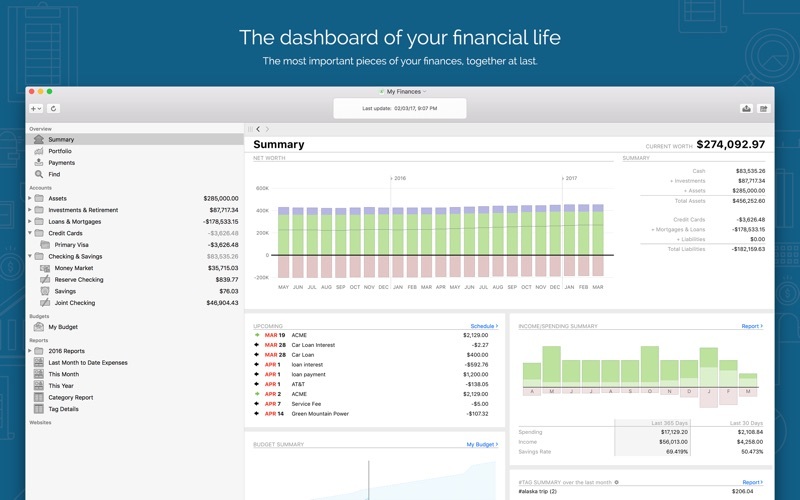 Banktivity has the tools you need to set up checking accounts, savings, credit cards, mortgages, investments and more. Then track each and every transaction: fine-tune them by categorizing, tagging, splitting or making custom edits — or let transaction templates do the work for you. Attach receipts or any file to transactions; reconcile to paper statements; search; track payments or transfers in any currency; and manage repeating events with scheduled transactions. Banktivity 6 also lets you pay bills online! Set up payees, send checks, track their progress and see them appear in your register. You can print checks, too. Update your accounts at once with Banktivity's Update Everything button, syncing devices and fetching Direct Access data and securities prices. Banktivity's investment features manage stocks, bonds, mutual funds, IRAs, 401Ks, CDs and other assets. You can track buys, sells, splits, dividends, options, etc. ; categorize investment transactions; retrieve quotes from Yahoo! Finance or foreign exchanges; analyze ROI and more. No matter where you are, you can enter transactions on the go with Banktivity for iPhone, or sync accounts, budgets and investments to Banktivity for iPad for mobile money management (apps sold separately). If you need help, get unlimited email support or Live Chat for answers in minutes. Banktivity offers built-in Help files, plus a downloadable user manual, a searchable Knowledge Base and video tutorials at our site. - Files with many transaction attachments save up to 100X faster, yay! -Fixed a bunch of other good stuff!